Item shown above : Solid Hardwood in Oak FINISH with a glossy protective coat (baseballs sold separately). Absolutely beautiful 46 baseball display case. Made from hand selected hardwood. Repeated sanded to achieve smooth and elegant appearance. 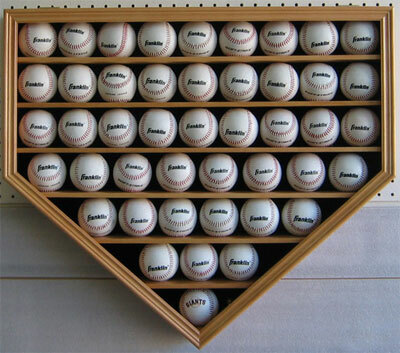 A great way to display your MLB and College Sport baseball collections. Black matted background and Hinged door cover to protect from dust and damage. Brass hinges and wall brackets to hang (Wall mounted). Indentations on shelves to secure the balls from rolling.